Shock testing is critical when equipment must survive concussive, sudden impact or high acceleration events and it is fundamentally different from sine or random vibration testing. 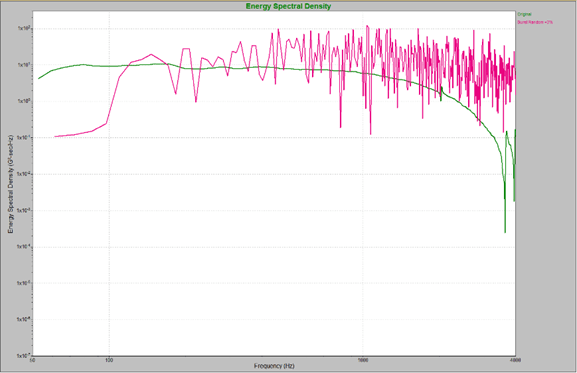 Vibration analysis uses Power Spectral Density (PSD) to display average acceleration for each frequency bin in a waveform; this isn’t useful for shock analysis, where the maximum shock acceleration at each frequency bin causes the damage. 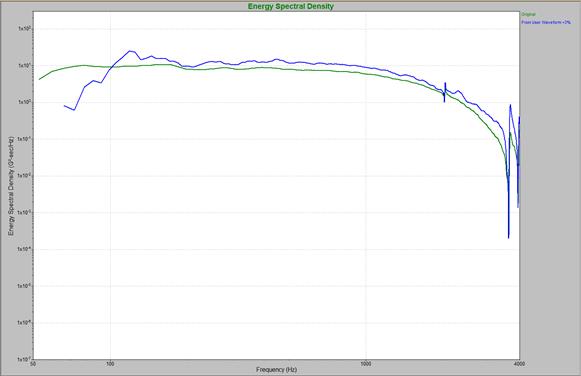 The discrepancy leads test engineers to study mechanical shock using a Shock Response Spectra (SRS) approach. Originally developed to replicate Seismic shocks, SRS testing has been widely adopted by the defense and aerospace industries. It uses a math model to synthesize a pulse that drives a shaker, simulating a shock (also referred to as a transient event). A Burst Random waveform overlaid on recorded data. Test engineers can select from a variety of standard synthetic waveform methods to create an SRS pulse, with the best choice depending on the application. 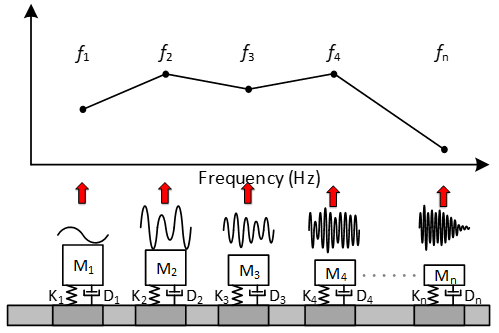 For example, the Burst Random and Enveloped Burst Random methods produce long duration stationary random waveforms that work well in earthquake simulation tests. However, often there is no synthetic waveform that closely matches a real-world transient event; engineers need a better, more realistic way to create an SRS test. Fortunately, there is a unique approach, where the actual recorded field environment is modified to meet or exceed a specified SRS. This provides a time waveform similar to the original field environment and, more importantly, its frequency response function closely matches the original field environment. This approach uses multiple real-world data sets and incorporates them into one representative waveform; using one event as the basis for creating a synthesized SRS waveform would give an incomplete description of shock vibrations that may occur in a particular setting. For transient events, the proper way to combine multiple real-world data sets is not to find their average accelerations, but to find the maximum value at each frequency. This ‘max enveloping’ technique produces an SRS curve using the maximum acceleration value from a group of real-world data sets for each frequency. The ‘max enveloping’ technique can be implemented with Microsoft’s Excel and VR’s VibrationVIEW software. There are multiple steps to the process but graphic displays by the software make it easy to grasp and even support iterations that modify an SRS to create a waveform that meets or exceeds the SRS maximax breakpoint table values. An obvious way to evaluate an enveloped environment SRS waveform is by comparing it with various standard synthetic waveforms. The software also supports these comparisons and test cases show visual evidence that makes a compelling case for the new approach.